With Buddha’s help, I learned how to use the stories and the interactions of the animals to help people who were struggling... I feel so grateful to have been raised by these mothers, these “women.” They have given me so much and taken so little. And they have shaped the course of my life and influenced my personality more than they could ever know. Last week was National Women’s Day and all I could think about were the strong cows and horses who raised me in the barnyard and taught me everything I know. Cows and horses live in a matriarchal society, led by strong females. In the horse family, there is a strong stallion who rules with an iron hoof, disciplines when necessary, and protects his family from others. But, behind that powerful stallion is always a smaller, older female who leads the herd to water and food and makes the decisions for the entire family. Bovines are led by a female who does it all: nurtures the babies, instills good behavior, and assists everyone in celebrating birth, mourning death, and raising the young. The male cows are raised to be helpful and respectful citizens, and the girls are raised to follow in their mom’s footsteps to have babies of their own and help their sisters. 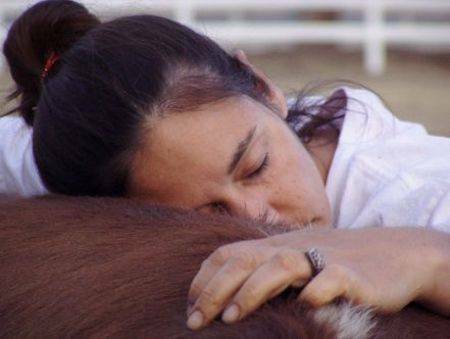 I founded The Gentle Barn as a young adult who had much to learn and experience. I grew up crying on the shoulder of my very first cow, Buddha. I learned to be still and quiet in meditation by her side. With Buddha’s help, I learned how to use the stories and the interactions of the animals to help people who were struggling. I endeavored to emulate her wisdom and grace. I wanted to be just like her when I grew up! Buddha was the perfect example of the feminine: strong yet gentle, powerful yet nurturing, had a great sense of humor who never missed an opportunity to laugh or joke, and was unwavering in her devotion to those she loved. When I celebrate National Women’s Day I think of Buddha and how she helped me become the mother, the wife, and the woman I am today. She might have been disguised as a furry, fluffy, red cow with fuzzy ears, a pink nose, the biggest eyes, and the longest lashes, but she was a matriarch through and through! When Buddha transitioned, she passed the torch to Buttercup who became everyone’s mom. Buttercup groomed every single cow after breakfast each day. She led daily meditations in the late morning for any cow or human who needed it. She was always available for an embrace. She made bad days better with just a smile. She ate with her whole heart, enjoying every chew. She drank clear cool water reveling in each sip. She would close her eyes in the sun and take deep breaths of fresh air in appreciation of life itself. She lived in pure joy and gratitude always. Just being in her presence made us feel like everything would be ok. She was beautiful, kind, and warm, and she gave the absolute best mom hugs. We were all so very lucky to have been loved by her! 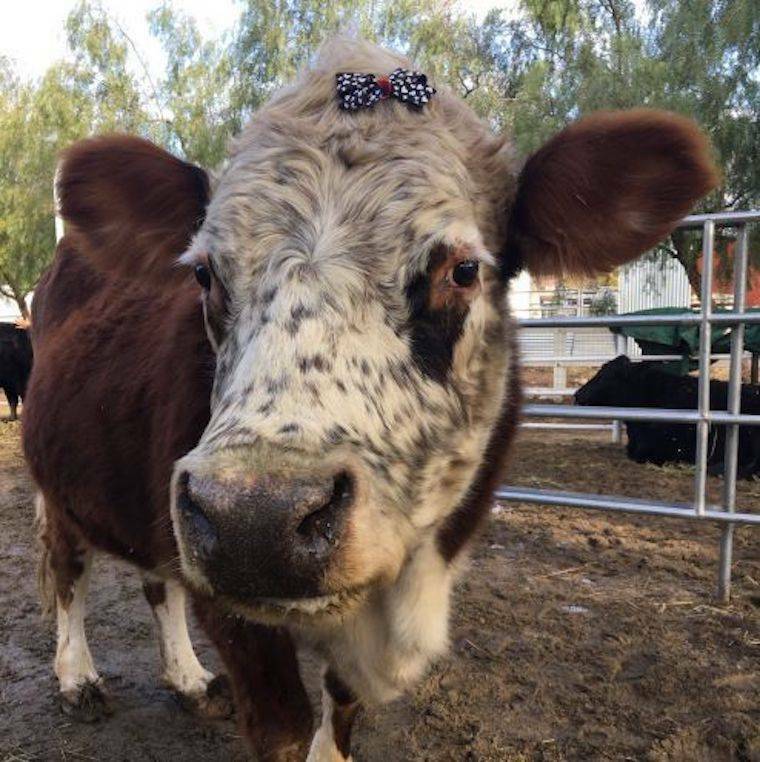 Our current matriarch at The Gentle Barn California is Karma and she is every bit as wise and wonderful as her predecessors. I remember years ago we had a naughty and mischievous cow named Vegan. Vegan outweighed Karma by about two thousand pounds. But one day Karma had enough of his rowdy behavior and with her head, backed him into a corner and made him stay there for three hours until he apologized and emerged a much humbled, better-behaved boy. Karma is no-nonsense and will not tolerate disrespect. But she will also allow us to snuggle up against her warm, red, pelt for hours with our arms wrapped around her freckled face as she closes her eyes and gives us her energy. She has outlived both her sons, yet is grateful for her life. She has suffered enormous cruelty at the hands of the backyard butcher before coming to us yet is trusting of humans and will be gentle with the smallest child. She is the unquestionable ruler of our bovine family, yet she puts others first, makes time each day for our male cow, Forgiveness, and is raising Ferdinand to be an ambassador, being ever kind and appreciative of his mom, Lucy. She never abuses her power or takes others for granted. And she will pose for pictures endlessly knowing she is a superstar among humans. She wears her bow each Sunday not thinking its silly. And she loves everyone whether they appreciate her or not, whether they can see who she is or not. I feel so grateful to have been raised by these mothers, these “women.” They have given me so much and taken so little. And they have shaped the course of my life and influenced my personality more than they could ever know. When I have had a hard day, I’ve gone straight down to the cow pasture to get a hug and some words of advice. They have never shamed me or made me feel silly. They have always taken my tears seriously and stopped what they were doing to hear me out. With them I felt safe and loved, cherished for who I am, and calmed just by the touch of their fur, or the look in their eyes. To all matriarchs safe or in slaughterhouses, loved or struggling, I say Happy National Women’s Day, we appreciate you and work hard to make a better world for you every day!